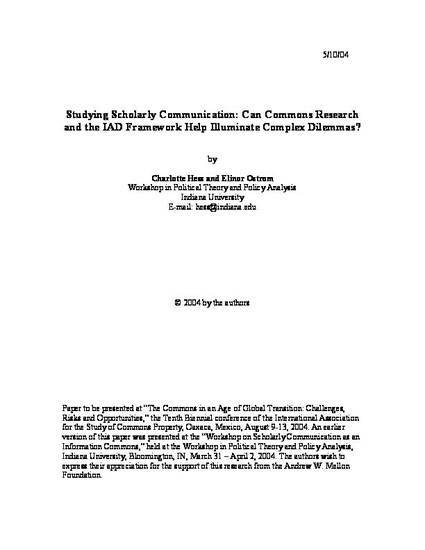 Studying Scholarly Communication: Can Commons Research and the IAD Framework Help Illuminate Complex Dilemmas? "This paper presents a framework for analyzing the complex resource of scholarly communication as a commons. Previously we have argued that the dilemmas associated with managing shared information are quite similar to those associated with managing natural and human-constructed common-pool resources (CPRs), where we can observe how the development of new technologies has changed the structure and processes involved in managing these types of resources over time. We concluded that collective action and institutional design play key roles in shaping economic and social aspects of information. "However, applying insights from the CPR literature on physical resource management to information management highlights the complexity of the issues involved in managing these particular processes and outcomes: there are many, diverse participants in producing and consuming information who often have conflicting interests; the nature of production and provision is often difficult to analyze and describe with the kind of specificity that is required to manage these processes effectively; digital technologies continue to evolve and are not always well-understood; production and consumption occurs in local and global arenas. "Whereas earlier we focused on applying the language, definitions, methodology, and outcomes of research on common-pool resources to understanding information management, in this paper we will extend and refine this analysis to develop a framework for analyzing the governance issues that arise from scholarly communication and the implications for further research."